Bolte’s Sunrise Sanitation offers a full line of residential roll-off container and dumpster services. Whether you need to dispose of a few large items or you have a substantial residential project that requires the use of a full-sized roll-off container, we will have a solution that is right for you. We know that finding time for cleanup can be difficult, so to make sure that we can accommodate your situation, we provide both long-term and short-term dumpster rental solutions. In addition, we make the process even more stress-free for homeowners by providing dumpster rental, pickup, and removal services. No Hazardous materials such as paint, paint thinners, weed killers, pesticides. We accept appliances; however, we ask that you load them by the back door. You must call in when done with the box as we will not pick up until you do call. Keeping the box for more than 10 days will incur $5/day rent. No electronics, including cell phones, pagers, handheld video games, calculators, radios, walkie talkies, small mp3, CD players, cassette players, digital and electronic cameras, computers, printers, scanners, copy machines, fax machines, televisions, VCRs, disc players, DVD players, stereo receivers, to name but a few. Our residential rental containers are the perfect way to get rid of unwanted remodeling debris or construction project waste, such as sheetrock, shingles, and plywood. If you have a landscaping project, do not hesitate to contact us, as we will be able to set you up with a dumpster so that you can dispose of waste materials, including concrete, dirt, and wood. By renting a roll-off container for your residential wastes, you will not have to worry about being charged extra disposal fees from your trash collection service provider and you will have an added peace of mind knowing that the waste materials from the project will be disposed of in a way that is environmentally friendly. 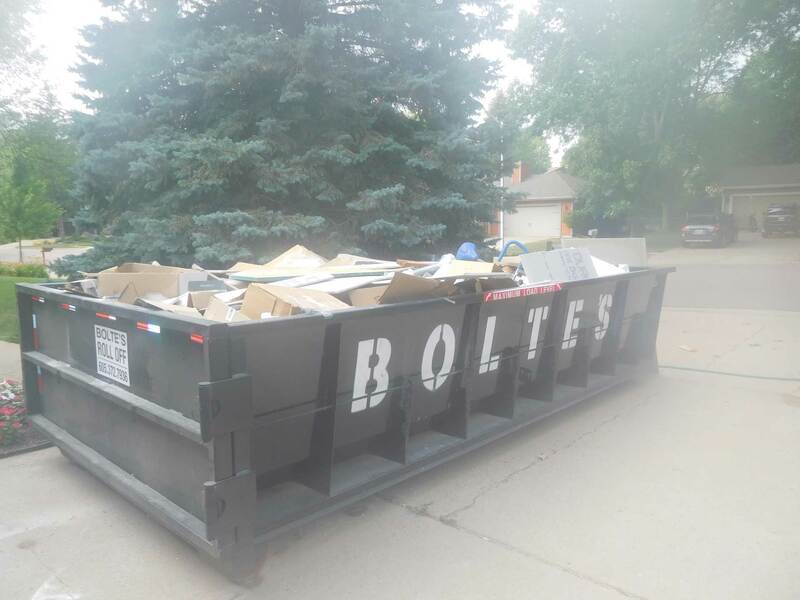 If you are considering a residential dumpster for your construction and landscaping waste, look no further than Bolte’s Sanitation Services. Our dedicated staff can guide you through every step in the process from addressing your dumpster size needs to scheduling a pickup date. At Bolte’s Sunrise Sanitation we know that scheduling for construction and landscaping projects can be difficult, so we offer both short-term and long-term roll-off container solutions. Whether you need to dispose of plywood, concrete, and shingles from the construction site or your landscaping company requires a dumpster for materials such as dirt, wood, and other landscaping waste, we will be able to set your business up with a container that is sufficient for the purpose. We know that disposing of construction wastes can be costly and time-consuming. To ensure that construction site cleanup goes according to plan, we provide dumpster rental, pickup, and removal services. By taking advantage of our construction waste dumpsters you will be able to maintain a clean and safe construction site. In addition, Bolte’s is devoted to maintaining an environment-friendly container service, and to stay in line with these values, we offer commercial recycling haul-away services. By taking advantage of our eco-friendly commercial recycling services, you can rest assured that your construction and landscaping wastes will be properly disposed of.